It's been years since the original green-skinned, purple-pantsed, Banner-bayed Incredible Hulk was free. Yet even before his sabbatical from the mortal plane, Hulky's unavoidable face-off with the son he'd abandoned on an alien world had been simmering on the backburner, growing more pent-up and furious by the minute. If the one true King Hulk is now finally back, ready to claim his throne, Skaar wants to be the first in line to offer a proper greeting. 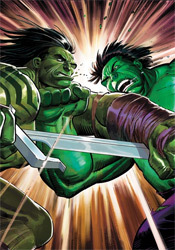 Though this issue technically acts as the blowoff to the recent World War Hulks storyline, in reality it's just as much the final act of the four-year-old World War Hulk crossover that gave Skaar a mission, sent the Hulk off on his greatest rampage and started the ball rolling on everything that's been going on in this family of books ever since. Adept at putting off the inevitable – and nearly breaking his readers' wills along the way – regular Hulk scribe Greg Pak proves equally proficient at finally delivering that long-awaited grand payoff in this month's edition. It's actually surprising how little time Pak wastes on setup considering his concentration on that in the past, but the shift is neither unwelcome nor inappropriate. Skaar and the Hulk spend just a single page on the requisite staredown before the first strike is thrown and from that point it's all melee, nearly all the time. On the few instances the two combatants take a moment to blink, Pak smoothly works in fitting flashbacks to several of The Hulk and Bruce Banner's most emotional moments. Brief glimpses into his life with Caiera refresh the present story, then flashbacks to childhood violence at the hands of his own father reinforce the parallels between his tale and that of his offspring. It's an obvious line to draw, and a part of Banner's upbringing that comes up more often than not in such major moments, but that doesn't make it any less powerful here, especially when the battle draws to a close in the issue's final pages. Naturally, any issue that relies so heavily on a major league slugfest is going to depend heavily on the work of its artist, and Hulk #611 is fortunate to have Paul Pelletier on board in that department. Pelletier crams the issue to the breaking point with brutality, harsh detail and brash, wanton violence. Through careful framing and an occasional break from the action, Pelletier takes situations that sound completely idiotic in theory (sailing through the stratosphere after an uppercut, Skaar actually catches fire from re-entry before taking a spinebuster into the ocean) and deliver them in a way that one can't help but appreciate the excess of the moment. He's singularly responsible for most of the issue's most successful moments, ultimately making a name for himself under a big spotlight. Ultimately, your appreciation of this issue will likely depend on your feelings about the Hulk family to begin with. Longtime followers and fans of the series will be enthralled by this installment, a climax they've waited half a decade to experience. Less-enraptured readers, though, might find Pak's cutaways a bit clunky and redundant, with Pelletier's artwork affected negatively by its stiff coloring. Neither side can deny that the action is loaded up and entertaining, and as a result the story just breezes right by. As someone in between those two camps, I enjoyed it in spite of a few weaknesses. Borrow it and make the final call for yourself.